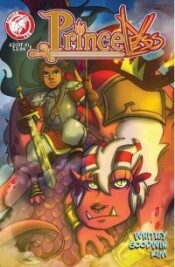 In the comic market there’s a tendency to think that the “All Ages” tag means a book is purely for kids. To a certain extent this is true. Chances are if a book is carrying the AA tag then it’s primarily aimed at a market that isn’t old enough to shave. Now if you’re the sort of consumer that tends to contemplate their possible purchases from behind a 3 day growth of stubble you might be mistaken for thinking that Princeless isn’t really the sort of book that’s going to fit in your standing order. Well let me ask you this. Are you a discerning reader that likes books containing high quality art & writing? Of course you are that’s why you’re reading this site. So trust me, Princeless will fit in just fine. You see it might be aimed at the younger market but there are still things that the older audience will appreciate too. Issue 2 sees Adrienne flying home to rescue her youngest sister Appalonia. Unfortunately this Apple has fallen & is now quite far from the tree, so instead we are given the chance to get more properly acquainted with Adrienne’s father & brother. 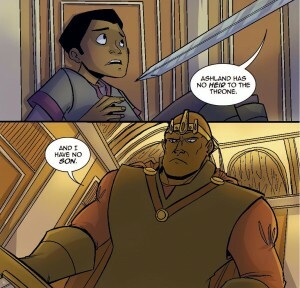 Now the men in Adrienne’s family are two very different characters indeed & it’s the relationship between these two that shows just how much skill goes into the writing on Princeless. Seen from a child’s perspective it would be easy enough to say that the Dad is a big meanie & even though the son wants to Dad happy, he’s still pretty OK. Seen from an adult’s perspective however there’s clearly more complexity at work in the story, but its delivery is astonishingly simple. With nothing more than a block & a parry Whitley neatly sums up the 18 years between father & son in 2 pages. Its impressive stuff & while it may never be discussed in depth in the book (this is not the sort of title to go dark just to get a streak of hipster cred), it lends more heft to these characters than your average Once Upon a Time based yarn & you realise that the creative team are aiming for a story that will genuinely appeal to all ages no matter what side of the shaving line they fall on. For all of the writings ability to work on different levels the art in this book is another matter. It appeals to everyone on the same level. It’s impossible to not have at least some appreciation for the work that goes into it. Princeless is a wonderful book to look at. The design’s & layouts are clean & simple with each character having their own distinctive look. The huge scowling figure of Adrienne’s father creates a wonderful contrast to his constantly grinning half pint daughter & the panels flow smoothly from one to the next carrying the story & making for some engaging visual humour. But it’s the colours that really make this book stand out though & while the computerised slightly anime(ted) approach may not work for every book, it really does for this one. Oh yeah & one more thing, the cover to this issue is a particular eye catcher as well. My thumbnails do not do it justice.